Crape myrtle (Lagerstroemia spp. ): growing, planting, caring. Crape myrtles are loved for their colorful and long-lasting flowers in the summer. Scientific name : Lagerstroemia spp. 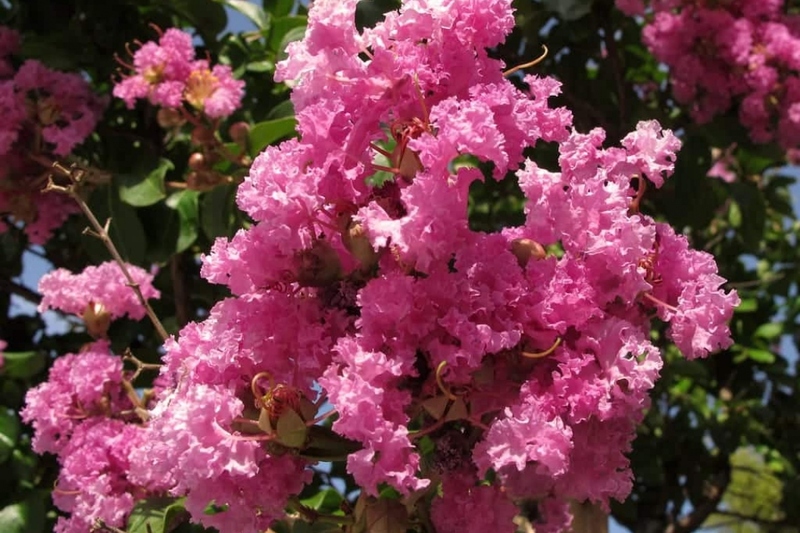 Lagerstroemia - crape or crepe myrtle - is a genus of around 50 species in the loosestrife family Lythraceae, native to the Indian subcontinent and parts of Oceania, and popular in warm climates. They are small to medium multiple-trunked trees and shrubs with opposite and simple 5-20cm (2-8 in) leaves with entire margins, and purple, red to white flowers in panicles with a crepe-like texture - hence the name. Lagerstroemia is a Genus of trees and shrubs with flowers in panicles, crumpled petals, brightly colored. The leaves are often opposite, of variable shape, and the bark is falling apart. Plant in autumn in mild climate and spring in northern ones. Find a very sunny location, in drained soil, rich and not too alkaline. Make a trim of your tree if your nursery did not: cut the branches that cross, those that come back inward, and shorten the whole. In bare root, remove the damaged roots, and most of the root hair. Dig a hole 2 to 3 times larger than the root ball, and plant without burying the root collar. In pots, plant in a large container or a large pot of at least 50 cm in diameter, in a mix of loam, compost with sand on a gravel layer. Water regularly and copiously for a few weeks after planting. After, you will have to worry about watering only if your Indian lilac is in pot: outside of these conditions, it will manage itself, and support better dry ground than wet ground. If you keep potted lilies, plan a to replace the topsoil every year in early spring, with some ordinary potting soil and a slightly larger pot. The pruning of the crape myrtle must be simple. Cut of entangled branches and those coming back inward is the minimum.